From the Architect home page, click or hover over the Flows menu and select the desired flow type. Create a new flow or select an existing one. The flow’s configuration page opens. Under Settings, select Speech Recognition. In the Speech Recognition area, under General Speech Settings, ensure the Enable speech recognition for the entire flow is checked. 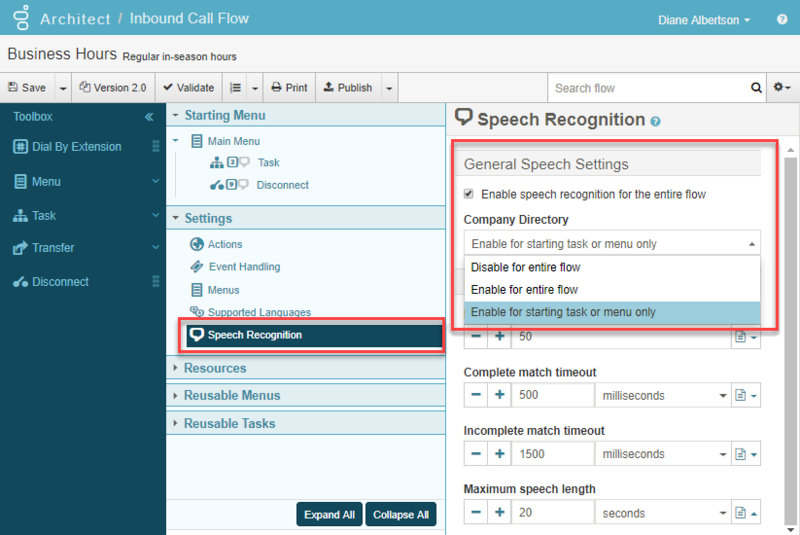 To activate company directory speech recognition for the entire flow, select Enable for entire flow. To activate company directory speech recognition for the only starting menu or starting task, select Enable for starting task or menu only. To leave the company directory speech recognition setting off, select Disable for entire flow.